Reasons for concern: The bright, showy flowers of this introduced ornamental belie its invasiveness and ability to compete with shallow-rooted natives. Its horizontal creeping rhizomes have regenerative buds that allow it to spread easily in disturbed areas and along roadsides and trails. Classification: Non-native. 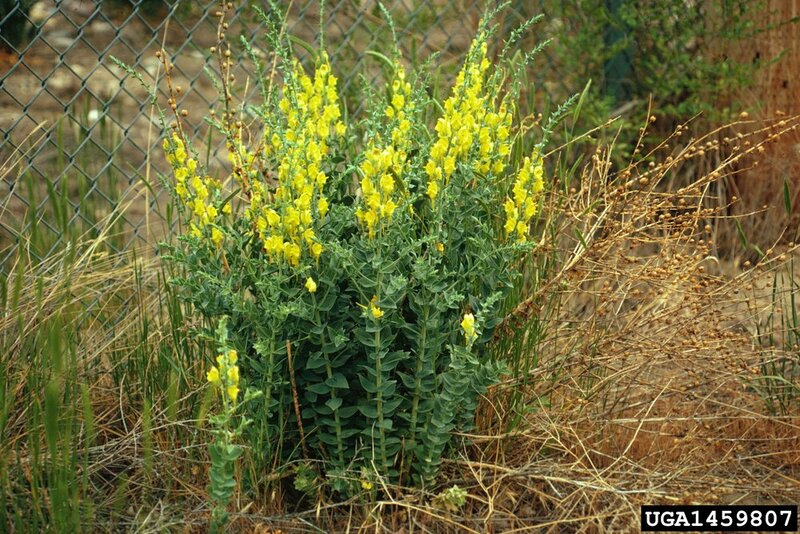 A restricted weed on the Arizona Noxious Weed List. Botanical description: Herbaceous plant with showy yellow flowers appearing on multiple long stems. Leaves: Heart-shaped to lance-shaped with pointed tips. Waxy, with blue-green color. Base of leaves clasp stems, alternating along the stem. Stem(s): Erect stems grow up to 3 feet, with increased branching toward top. Stems are rough and woody at base, smooth and waxy toward top. Individual plant can produce up to 25 stems in one year. 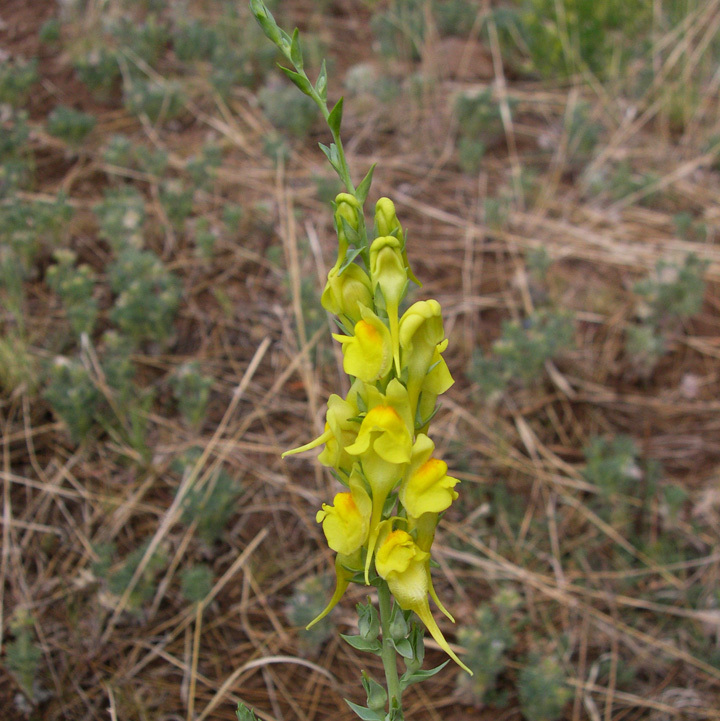 Flowers: Showy, resembling snapdragons. Petals are 2-lipped, bright yellow, sometimes with orange centers, bearded throat, and long spur (3/4 to 1-1/2 inches long). Two lobes of upper lip point upward. Two lobes of lower lip point downward. Flowers mature from lower part of stem upwards, and appear June through early October. Seeds: Tiny 2-celled capsules with many irregularly-shaped, sharply angular, slightly winged, black seeds. Roots: Plant has both taproots and horizontally creeping stems (called rhizomes), which produce new plants. Roots can grow 4-10 feet deep and extend 10 feet from plant. Where it grows: Roadsides, pastures, rangeland, forests, waste areas, southern and southeastern facing slopes, meadows—almost anywhere at elevations of 5,000 to 9,000 feet. Life cycle: Perennial Reproduction: By seeds (July through October) and by vegetative reproduction from buds on rhizomes. 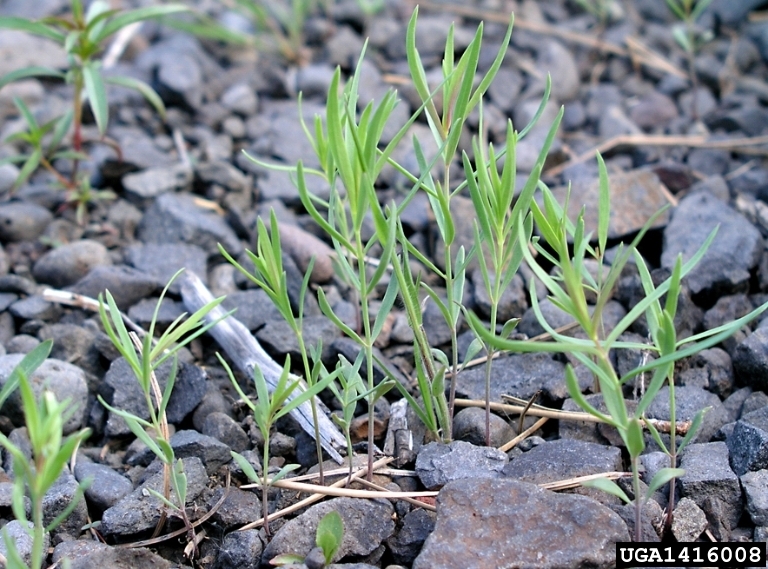 Weedy characteristics: Each plant can produce up to 500,000 seeds, which are viable for 10 years. A high percentage of these seeds will germinate. It is difficult to completely remove spreading roots. Control strategies: Hand pull or dig. Try to get spreading roots. Monitor site regularly and remove new seedlings. Never let plant flower or go to seed. Bag all flowers, seeds, and roots after pulling. Step down any loose soil after digging. 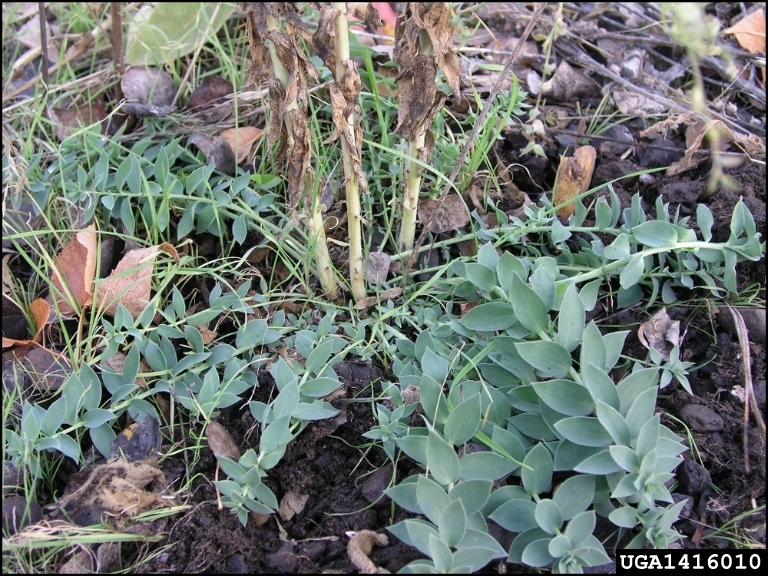 Herbicides may be ineffective as they are repelled by plant’s waxy leaves. Plant desirable species to outcompete invasives. Mechanical control is not effective. If plants are cut or weedwhacked, they will re-grow. Herbicides can be effective on actively growing plants. Contact your local county extension office for more information on chemical control.